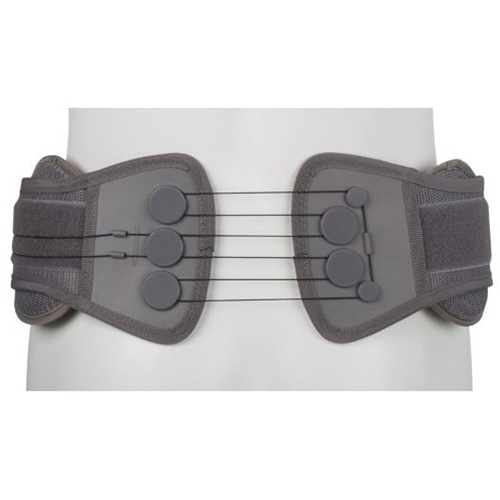 Ottobock Low Profile SI Belt from HealthyKin.com provides stabilization of the sacroiliac (SI) joints through direct circumferential compression utilizing the 3 to 1 ratio mechanical advantage pulley system. The SI belt is prescribed for conservative treatment of sacroiliac strain or arthritis. Just what we expected. Tried one on at the Dr's office. Got the info so we could order one online. We were amazed at the wide variance in price for this item online - ordered here because they had the best price we could find and we weren't disappointed. I have a lot of back issues such as; DJD DDD Arthritis SI joint Sclerosis and even fractured my L5 I have tried another SI belt that has the pressure pad in the back and that did not help much. Since this belt has the adjustable pads on the sides, it is perfect for me as they put pressure right in the pockets of where my SI bothers me most. This belt helps me to get small things done now throughout the day. So happy with the brace, has relieved a lot of my pain. Comfortable wearing and like that I can adjust pressure with it. I have complex lower back pain issues. Wearing this belt through the day eliminates the pain I experience in bed. I can now sleep through the night. Unfortunately there are other problems which cause most of the up-and-around pain. I have had several of these belts before,they work well and with a slight alteration would rate 5 stars instead of 3.The problem is that the velcro wears out to fast.Simple solution,add a strap/buckle to the right side that fits thru the left side adjustment ring and back to the right side.Two things it would do,take the stress off the velcro so it doesn't wear out and also will press the velcro down and keep it from warping.If you would like I could send you the belt I've already altered. I have had 5 back surgeries L-3-S1 fusions and have been having extreme pain in my SI joint. The brace has provided more pain relief and support than anticipated. I would highly recommend this model. Great for sciatica! My problem is also lumbar so it doesn't go high enough to help there. BUT, it can be worn higher if you need extra support in the lumbar. This is NOT the intended purpose of this item.